Citation Information: JCI Insight. 2019;4(1):e124863. https://doi.org/10.1172/jci.insight.124863. Mucus produced by submucosal glands is a key component of respiratory mucociliary transport (MCT). When it emerges from submucosal gland ducts, mucus forms long strands on the airway surface. However, the function of those strands is uncertain. To test the hypothesis that mucus strands facilitate transport of large particles, we studied newborn pigs. In ex vivo experiments, interconnected mucus strands moved over the airway surface, attached to immobile spheres, and initiated their movement by pulling them. Stimulating submucosal gland secretion with methacholine increased the percentage of spheres that moved and shortened the delay until mucus strands began moving spheres. To disrupt mucus strands, we applied reducing agents tris-(2-carboxyethyl)phosphine and dithiothreitol. They decreased the fraction of moving spheres and delayed initiation of movement for spheres that did move. We obtained similar in vivo results with CT-based tracking of microdisks in spontaneously breathing pigs. 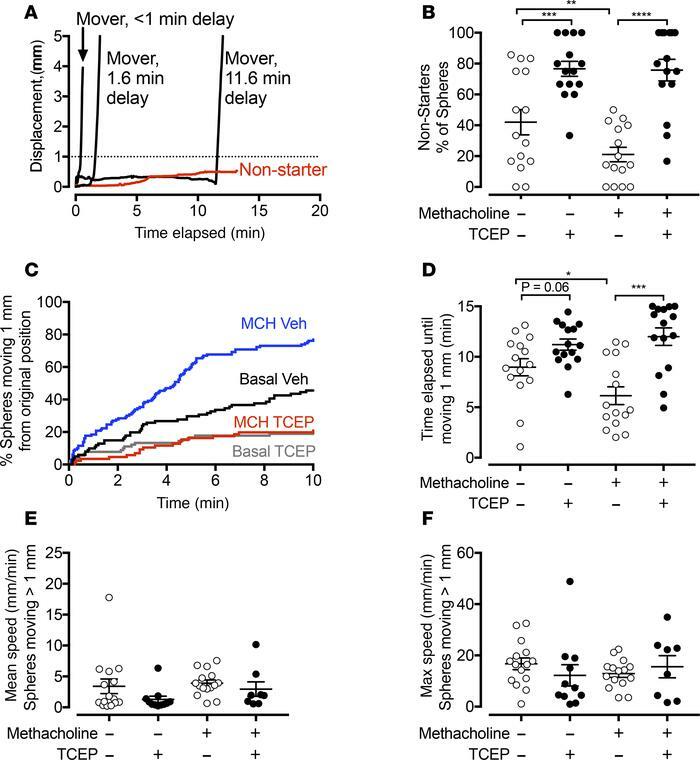 Methacholine increased the percentage of microdisks moving and reduced the delay until they were propelled up airways. Aerosolized tris-(2-carboxyethyl)phosphine prevented those effects. Once particles started moving, reducing agents did not alter their speed either ex vivo or in vivo. These findings indicate that submucosal glands produce mucus in the form of strands and that the strands initiate movement of large particles, facilitating their removal from airways. Reducing agents disrupt initiation of transport of spheres ex vivo. Time-lapse photographic tracking of metallic spheres on segments of pig trachea in the presence or absence of reducing agents. (A) Examples showing the displacement from original position as a function of time of 4 spheres. Some spheres moved immediately, and others had a variable delay before moving. Some spheres did not move (non-starters, red). A dotted line marks the 1-mm threshold for movement. (B) Percentage of non-starters in the presence and absence of methacholine (100 μM) and the presence of vehicle or TCEP (1 mM). Spheres were tracked for at least 10 minutes or until they moved. n = 15 per group. Each data point is from a different pig. (C) Percentage of spheres moving >1 mm from original position as a function of time. Data are pooled from 15 experiments, with 86–130 spheres tracked per condition. Conditions are basal/vehicle (black), basal/TCEP (gray), methacholine/vehicle (blue), and methacholine/TCEP (red). (D) Time elapsed before spheres moved >1 mm from original position. n = 15 per group. Each data point is the mean from a single pig. (E and F) Mean and maximum speed of moving spheres. n = 8–15 (some conditions had no spheres moving >1 mm). Each data point is from a different pig. Lines and error bars represent mean ± SEM. Some error bars are hidden by symbols. *P < 0.05, **P < 0.01, ***P < 0.001, ****P < 0.0001 by 2-way repeated-measures ANOVA with Holm-Sidak’s post hoc multiple comparisons test in (B and D) or Kruskal-Wallis test for nonnormally distributed data in (E and F).